Let's say you're among best in the world at some bizarre sport that only gets attention every four years. You can't make money doing it for a living, and eventually you fall on hard times. At the end of your rope, you go to a pawn shop to sell your most treasured possession: your Olympic medal. How much would you get for it? Let's just say, I hope you finished in the top two. There are plenty of medals on eBay and other auction sites, but the historic, symbolic, and sentimenal values far outweigh the cost of the raw materials. But if the London medals were to be melted down, they've each got a very specific intrinsic worth. • The gold medal is largely silver, 92.5 percent silver with a bit of copper mixed in for strength. But they're gilded in about 6 grams of 24k gold. Their street value: about $644. 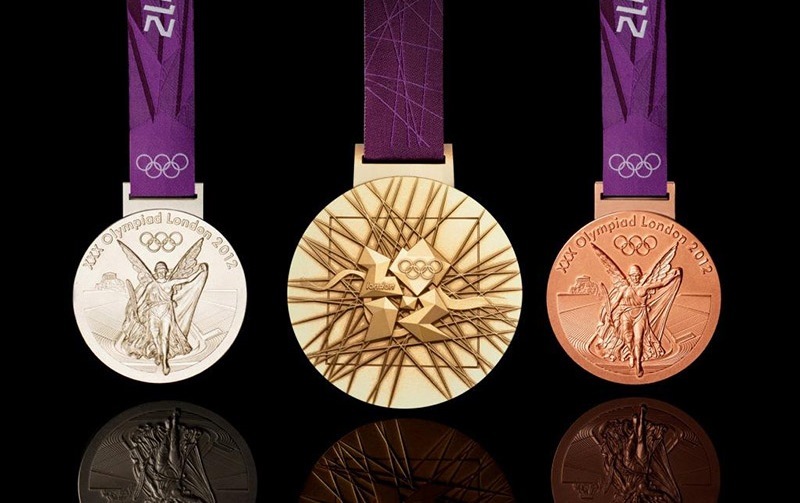 • The silver medal's composition is the same as the gold, except without the gilding. With no gold, the silver medal is worth about $330. • The bronze medal is not bronze at all. Mostly copper, with a bit of zinc and tin, it's basically a giant penny. It's worth a little less than $5. Of course for those who actually earned the medals, they're worth more. They're a lot like those commemorative coins they advertise on the Military Channel, with the Twin Towers on one side and a weeping bald eagle on the other—ask your grandpa, you can't put a price on history.